A major Harvard study of over 100,000 people recently found that fruit and vegetable consumption did not seem to dramatically reduce chronic disease risk, leading to misleading headlines like "Fruits and Veggies No Help Against Cancer." This finding may not be so surprising to those who've attended my lectures on cancer prevention, where I point out that America's favorite vegetables are 1. French fries and 2. Iceberg lettuce. When the researchers looked more closely at the data they indeed found that those who ate the most of the healthiest produce (green leafy vegetables) were afforded significant protection against chronic disease, but even then the protection seemed modest. Perhaps this is because their intake was modest as well. Of the 100,000+ men and women studied, those that ate the most green leafy vegetables ate only one and a half servings a day--about 4 outer leaves worth of romaine lettuce. And so they compared that group to those that ate the equivalent of only about half a leaf a day. With a range of intake that narrow it is no wonder a greater difference between disease rates was not found. Again, this is where Dr. Campbell's "The China Study" comes in so handy. Evidence from the biggest study on diet cancer in human history, the EPIC study, which is currently following half a million people across ten countries, has found that indeed high fruit and vegetable consumption is linked to decreased cancer mortality. The USDA recently upped the official Federal recommendation for the minimum daily servings of fruits and vegetables to nine. Nine a day. Thought you weren't doing so good before? Well now you may be really behind! Make sure to take full advantage of this recommendation by including the nutrient superstars of the fruit and vegetable kingdom, dark green leafy vegetables and berries. 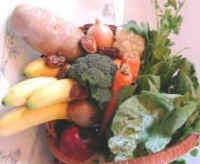 "Fruits and Veggies No Help Against Cancer" Reuters 2 November 2004. Khaw K. "Study Progress and Results of the European Prospective Investigation into Cancer and Nutrition" Journal of Nutrition. 134(2004): 3519S.